Sunday is traditionally a day of rest, however when you’ve been attending a jazz festival for the last 10 days, (funny how people don’t view that as work), other things that should get done on weekends and nights, get pushed aside for the very important task of attempting to document the performances of the various artists. 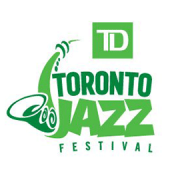 The last day of the TD Toronto Jazz Festival, Sunday July 2nd, found me downtown, not in a festive mood but working hard in a valiant attempt to paint my eldest daughter’s apartment. We worked on it till we were exhausted and starving, about 6 hours straight. Once I convinced the gang to call it quits and go for cold beverages and food, the question then became, where do we go? Having studied the TD Toronto Jazz Festival program guide I knew we were close to a club called Dominion on Queen. I had no idea where on Queen, whether they were open, or if they had food. Driving east on Queen from Jarvis, we found the club about two major intersections away from the apartment. The club was open, a big TD Toronto Jazz Festival banner flying outside. The menu on the table indicated a mixed grill was available, offering a culinary journey from Greece to Mexico with side trips to Italy and stops in North America along the way. We ordered a small feast from around the world and set to work on rewarding the day’s labour. As we were going through the long list of draft beers available with the waitress, she mentioned that the cover for the jazz festival show would be added to the cheque. I had no idea that an afternoon show was scheduled, I swear! I recently caught Kirk MacDonald performing in the lead tenor chair for the Art of Jazz Big Band, a knock your socks off performance. I’m looking forward to CBC Radio broadcasting that performance as promised. I have heard a rumour that the re-broadcast may not happen, a disappointing rumour that I will check into. 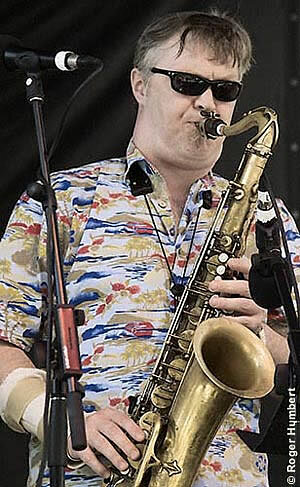 Kirk MacDonald has recorded many CDs as a leader and as a sideman. One of my favourites is the Atlantic Sessions, on the Koch Label. The Atlantic Sessions features MacDonald on tenor sax, Lorne Lofsky on guitar, Neil Swainson on bass and the late, great, Jerry Fuller on drums. Kirk MacDonald is currently at work on his own big band project that holds great promise. Lofsky is one of a half dozen of the greatest jazz guitar players in the world, who fortunately for we Torontonians resides here and can be found in the unlikeliest of places — The Dominion on Queen, during a summer afternoon. 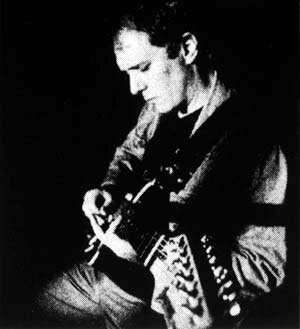 Over the course of his distinguished career, Lorne Lofsky has recorded with a who’s who of international jazz artists and appears on a couple of dozen CDs. My favourite, Bill, Please on the Inspiration Label, finds Lofsky in the leader’s chair. The members in fine support of this effort are once again the great drum Master Jerry Fuller and bassist Mike Downes. This is a masterful tribute album to the great Bill Evans trios of the late fifties and early sixties. The Dominion on Queen, located at 500 Queen St. E. in Toronto, is a great spot to catch a show. The sight lines are very good; the room is a long rectangular shape with the stage at the opposite end of the room, short side. The bar is to one side, well out of the way. The sound is pleasant, the 100 year old wood creating a nice ambiance. Good food, good drink and a fair cover charge. July is the Robert Mondavi Jazz Series, according to the advertisement. I hope the club continues to feature great jazz acts such as Kirk MacDonald and Lorne Lofsky throughout the year. Especially in light of the demise of the Montreal Bistro.